Cold weather. It’s been a long time since I experienced cold weather. In the three years since moving to Thailand, I haven’t really experienced any temperature colder than 15c. That all changed last week as I was working in Seoul for five days. The temperature when I left Bangkok is was 36c, six hours later I was standing in 2c temps with a solid wind. Wow. Hello Seoul. And so we complain about the hot climate in Bangkok while those I work with in Seoul are worn down by the long, cold winter. Yes, the grass is always greener and after five days I was happy to return to the heat and humidity. I’ve gotten soft, cold seems a lot colder, my sinuses dried out instantly, my skin felt very dry and my lips chapped within two days. The cold did feel good, it was nice to wear layers of clothes and a jacket. Other than the shock of the cold temperature, the thing that stood out the most was the lack of color associated with the cold temperature. 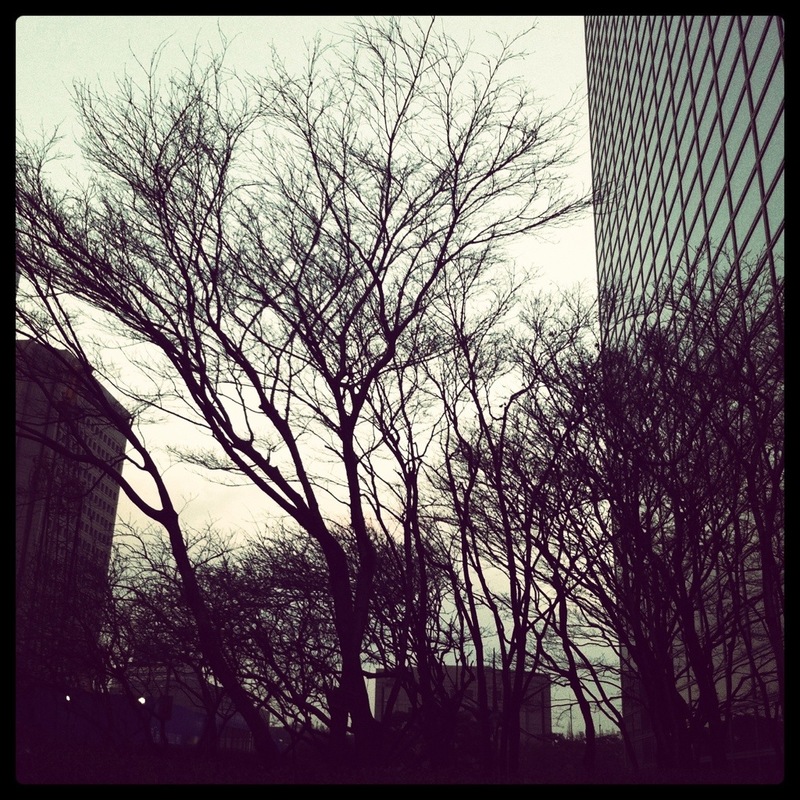 The leafless trees and weak sun were a shock after coming from year-round technicolor found in Bangkok and Thailand. Thailand now enters the hot season, which you survive just as you would a cold season: dress appropriately, don’t stay outside for long, try to keep a good attitude and hope it’ll be over soon. This entry was posted in photographs, Weather. Bookmark the permalink. Nice blog. Thanks for sharing your experiences. What do you do about getting exercise in Bangkok? I visited Bangkok last year in April-May, when the heat was peaking. I was able to do some walking around the city, provided I drank 3 – 4 liters of liquids per day and ducked into various 7-11s along the way. But there’s no way I could exercise in that heat, not even when it’s a few clicks cooler in the so called “cool” season. Even if the temperature allowed it, I imagine exercising outdoors would mean inhaling mega doses of pollution. I guess gyms are the only option. Maybe bicycling, too? Hi. I actually do exercise outdoors, but avoid the peak ‘heat’ times when exercising. Lumpini park is great for running and walking in the early morning and there are many aerobics classes being taught throughout the park, there is also yoga all kinds of other group activities- from fan dancing to stretching; Lumpini is great. I also ride a bike- again, early in the morning- and usually ride a bit out of Bangkok, using the access roads to ride out near the new airport. The pollution can be bad and the humidity is always a factor, it took me a few months to acclimate. Thanks. I’ve been thinking about heading to Bangkok to look for a teaching job. The one thing that’s held me back from going is the weather. To be honest, I’m not sure if I’d ever get used to it. I think it’s something that I would just deal with, and try to not let my mind judge it. I remember seeing body builders in Lumpini park in the middle of the day. I thought to myself, “how hardcorde.” Fan dancing sounds like fun. I love to dance, and learning a new dance would be great. Thanks again for sharing your life there. While you say that your blog is selfish, it actually does serve more than just yourself. For various reasons people may find themselves considering a permanent or temporary life in another country. The information that you share helps demystify a place.